Interval isn’t quite like anything else you've played. It is an instrument which „has real life and breath“ as composer Theodore Shapiro said. Inspired by contemporary compositions Interval pursues a new approach into building sounds. It is hard to explain, but in the broadest sense, it is an instrument for building inspiring pads, organic atmospheres as well as creative arpeggios. You can do things with it you can’t do with anything else. 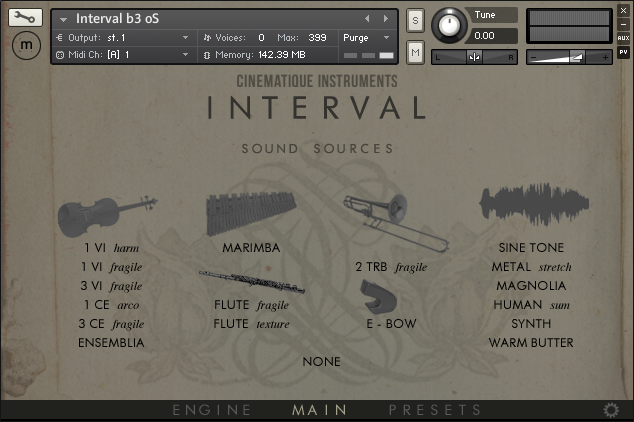 Interval features two main issues: the extraordinary selection of sound sources (samples) and an unqiue engine to create harmonies. During our latest recordings of orchestral instruments we have spent extra time for recording very light and fragile sound articulations. As the result we are happy to unveil an extraordinary collection of gentle and shimmering long notes of violins, celli, flute and trombones which are breathtaking. To round off this palette of sounds we have added some fine selected sounds such as harmonic violin, ebow guitar, a sine tone and more. (see full list below). Alone by playing these beautiful sounds in a traditional way like - without using the Interval engine - you will have a great experience of shimmering pads and organic sounds! This playing will be refined by Intervals engine with what some composer told „It isn’t quite like anything else I’ve played“. It is an easy but astonishing concept. 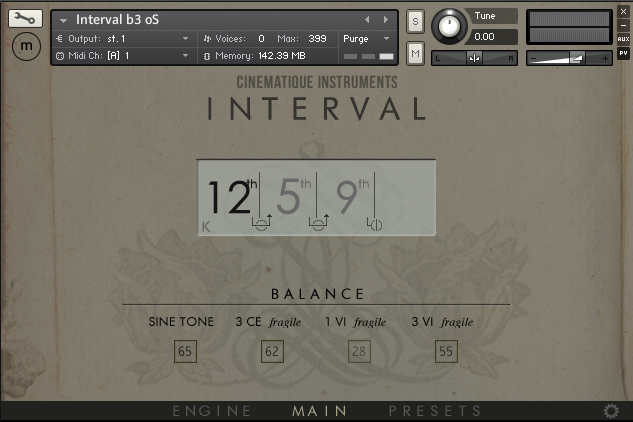 Interval just layers equal intervals (up to eight) on top of each other and the result is a distinct cluster with timbres ranging from bright and clear to complete cacophony. For example, if you are playing an C by a selected fourth interval, Interval will play C-F-Bb-Eb1-Ab1-Db2-B and so on, or a C with a bunch of superimposed fourth notes. And really true, what you now hear is an inspirational sound with unconventional harmonies ! The fundament of Interval are four separate sound slots which can be simultaneously played. Just click on the slot name to select one of the 17 instruments (see list below) to set up your favourite mix of sounds. Each sound can be used only once. In order to shape the overall sound there are a lot of tools available: attack/ release time, increase/ decrease of the highs and lows, three delays with adjustable feedback, a reverb and and an LFO which works separately for the four sound slots. 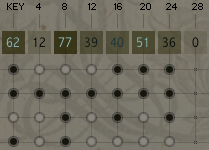 After creating your sound, you can now spread the four sound slots separately to each interval step. Just click on the interval nodes to activate or deactivate the corresponding interval. Each interval step has also a separate volume control. To understand how it works just change the interval (bold number in the centered field) and see what happens when you play a note. (more detailed described at the Engine View). 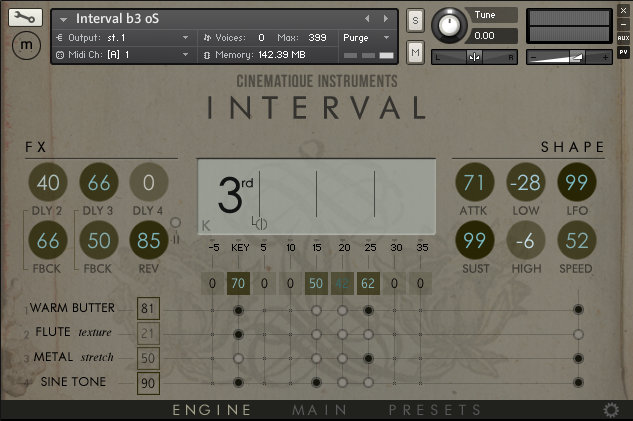 Interval provides four intervals slots. You can access these different intervals by keyswitches (C0 – Eb0) or in chain-mode which skips through the intervals by each key stroke. For more details please read the Interval manual. . Please note: the free bonus of Intimate Piano is no longer part of Interval. Take a look at how Adi Goldstein is creating a piece of music with ‪‎Interval‬ as well as with our beloved ‪Intimate Piano‬. Interval - Hands on - How does the Interval work & building sounds form scratch.